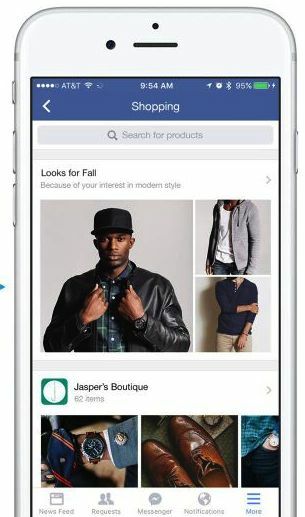 Facebook’s where people spend their time on mobile, and now it’s working on several new features to give shopping sites a cut of the attention. The most eye-catching is a test of a Shopping feed that aggregates posts and photos about products on sale from different retailers. It’s also beefing up the fast-loading “immersive ads” it started testing last month by letting merchants host whole product catalogs on the pages that load inside Facebook instead of kicking users to a mobile browser. This is all part of Facebook’s goal to consume the shopping experience. Today’s corporate blog post also mentioned its in-feed Buy button, carousel product ads, and new Shopping sections of mobile Pages that’s designed to be an alternative or supplement to retailers needing their own mobile commerce apps or sites. The Shopping feed is a single place to browse the different products being showcased across the social network, according to Emma Rodgers, Facebook’s product marketing lead for mobile app ads and commerce. A survey from the company showed 50% of users come to Facebook looking for products, and the Shopping feed could pull those out of the chaos of friends and news in the main feed. It’s accessible from the Favorites section of the Facebook app’s navigation menu. There you’ll be presented with a feed of products that businesses have chosen to highlight on their Pages, personalized based on things like your Facebook connections, likes and interests. Rogers said that like the other features the company is discussing today, this is a test being shown to just a limited number of users for now. The screenshot above also shows a search bar. In addition to offering a more purposeful way to browse the feed, search could potentially give Facebook new opportunities for keyword-based advertising. As Google has demonstrated, knowing that a user is searching for a specific type of product makes for a pretty enticing proposition for advertisers. Facebook last tested a form of keyword ads in 2012, allowing game developers to appear at the top of typeahead results of searches for their competitors, though the test was never rolled out. Google has historically ruled this type of high-intent advertising, but Facebook could be priming itself to make a move. The Shopping feed’s search bar could give it the perfect channel for these traditional keyword ads. The only issue is that features buried in the nav menu are often forgotten by users — out of sight, out of mind. Facebook is also highlighting a new use of its immersive ad format, now called “Canvas,” that allows users to browse different products in a fast-loading, full-screen experience. Canvas has been compared to Facebook’s Instant Articles, and in this case, it allows users to browse different products, then zoom in and see the details on a specific one. Then they can click and are taken to the retailer’s website. Rodgers said that this ad experience has been designed to help businesses with the shift to mobile. One of the challenges, she said, is that users may click on a product ad in Facebook, then find themselves taken to a website that doesn’t load quickly enough or hasn’t been fully optimized for smartphones. With these ads, Facebook is “giving these marketers a post-click creative space to achieve their business objectives,” she said. In other words, they get to create a fast, slick browsing experience for users who have already expressed an interest by clicking on their ads. It’s worth noting, however, that the ad still takes you to the retailer’s website, eventually. While Facebook is, as mentioned, testing its own Buy button, that button isn’t being used in the current iteration of Canvas ads. Rodgers said the focus here is on the product discovery and product research experience, rather than on the actual purchase. Facebook’s quest to absorb the Internet continues. What began as people’s social graph and personal information has rapidly expanded to include videos, the online of presence of the businesses they interact with, how they consume news, and now shopping. If Facebook can make discovering products a less interruptive, more seamless part of the browsing experience, users might be less hesitant to shop while they network. Making the world more connected doesn’t just mean to other people. And with these features, more that can happen within Facebook’s walled garden.